Home > Invasive Tests > What is Perfusion Scanning? Perfusion scanning is basically and advanced form of medical imaging that aims to ‘see’ the passage of fluids through body tissues. The fluids can be oxygenated blood, deoxygenated blood or lymph and the technique can diagnose a variety of health problems. The main organs that doctors are interested in when they decide a perfusion scan is necessary are the heart and the brain. The brain is the most sensitive organ in the body to a lack of oxygen and even tiny blockages in blood vessels can lead to severe damage, resulting in a stroke. The heart can also be damaged; when a coronary artery becomes very narrowed by atherosclerosis or a blood clot, angina develops and the risk of having a heart attack increases dramatically. Perfusion scanning can reveal how well the blood is flowing through both organs and whether there is narrowing of blockage of any of the vessels. Visualising perfusion is done with standard imaging techniques such as computer tomography (CT) scanning and magnetic resonance imaging scanning (MRI). CT perfusion scanning is a new technique that is only applied to the brain so far. 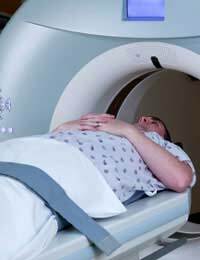 In MRI scanning, a contrast agent called gadolinium is passed through the tissues under investigation to enable the blood vessels to show up more clearly. Nuclear medicine can also be used; in this technique radioactive isotopes are injected into the blood before scanning. There are two main forms. The first, VQ scanning, is used in the lungs to detect problems with perfusion and also with ventilation – how easily air is getting into and out of the lungs. This form of perfusion scanning is used in patients who are suspected of having a pulmonary embolism – a blood clot in one of the arteries taking blood from the heart to the lungs. Single photon emission computed tomography (SPECT) combines nuclear medicine with CT scanning and produces a three-dimensional image. This is very useful when used on the brain and heart to give an overall picture of perfusion and also how well each organ is managing to perform despite the problems. A cardiac perfusion scan is used to find out how well blood is flowing through the muscles of the heart. Collectively, the heart muscles are known medically as the myocardium, so this is often called a myocardial perfusion scan. A radioactive substance is injected into the veins so that its passage through the heart can be followed. The images produced can show how blood is flowing through the heart walls and can detect any blockages in the coronary arteries. The detail is very good and it is possible to see where the blockages are and how large they are. This information can be very useful for a cardiac surgeon who later needs to perform a coronary artery bypass graft on the heart. The perfusion scan can also find out just how badly damaged a heart is following a heart attack. To get the most information from a scan, it is good to look at the way blood flow through the heart changes during exertion. If you are fit enough when you have the perfusion scan, this may mean doing a stint on an exercise cycle during the test and then having the gamma cameras take pictures of your chest while your heart is beating strongly. For people who are not well enough to do this, a drug is used to speed up the heart to mimic the effect of exercise. It is possible to do the exercise test and the ‘at rest’ test on the same day, or it may be done the day after and then it will take a while for the doctors and specialists to look at the scan images before they can let you know the results. The main advice that people are given after a perfusion scan is to avoid small children for a couple of days, until the radioactive tracer has completely left the body. The amounts of radioactivity are very small but it is a sensible precaution to limit exposure to other people, particularly babies and children who are most vulnerable to the damaging effects of radiation. It is also sensible to flush the toilet twice after urinating and to wash your hands carefully, as the radioactivity leaves the body via the kidneys.